The West Bromwich Building Society is in talks with debt holders over a deal that could secure its future. The society said it was in "advanced discussions" over a debt conversion that would boost its balance sheet. 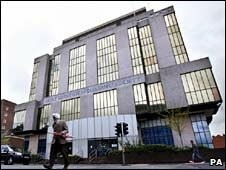 BBC business editor Robert Peston said that the West Bromwich could remain independent or end up merging with another building society. He added that savers with the West Bromwich would not lose a penny and its mortgage borrowers would be unaffected. The society's financial difficulties had led to reports that it may be broken up. The West Bromwich employs about 850 staff in 46 branches and has about 350,000 customers. It is the UK's eighth largest building society. Last month, it denied reports that it was on the verge of collapse. The society is due to report its full-year figures on Monday, which are expected to reveal big losses. Our correspondent said the society had "pushed the boat out a bit too much" on commercial property and buy-to-let lending. But if the society can persuade debt holders to convert their debt into capital, then it should avoid being broken up, which is what happened to the Dunfermline Building Society. The conversion would effectively mean that it acquires a financial buffer to absorb losses and avoid insolvency, allowing it to keep its independence or to merge with another society at some point in the future. David Buik from BGC Partners, who said he had hoped the West Bromwich would follow the same route as the Dunfermline, warned that other building societies could come under pressure to merge. "I suspect that the West Bromwich is not the only one that is under duress and I wouldn't be at all surprised to see the FSA and the government try and recommend many mergers, however desirable it is for people to keep their own brand name," he said. Last month, the West Bromwich, along with four other societies, was downgraded by the credit ratings agency Fitch. The agency said that the weakening economic environment had increased the credit risk of the societies. The long-term outlook for the West Bromwich was downgraded from an A- to a BBB+. But a spokesman for the society said it remained "a safe and secure home for members' savings". The potential rescue of the West Bromwich comes after a series of mergers in the building society sector. In September last year, the UK's biggest building society, the Nationwide, agreed to stage a rescue takeover of two small societies, the Cheshire and the Derbyshire. Skipton Building Society agreed in November to merge with the smaller Scarborough Building Society. The following month, the Barnsley Building Society was rescued by the larger Yorkshire Building Society, the same day as the merger between the Chelsea and Catholic societies was completed. Banks have the option to approach their existing shareholders for more capital if they get into trouble, but as building societies are owned by their savers and borrowers that option would not work. Are you a West Bromwich Building Society employee or customer? Send us your comments using the form below.